A farmhouse sink, like the one pictured on the left from Amazon, is one of those fixtures that has waned and waxed in popularity. Decades ago, every house that could afford such a large sink, proudly boasted one. 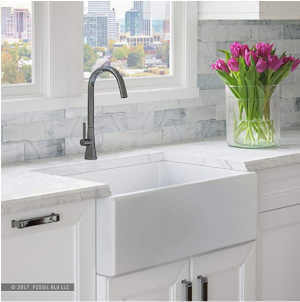 Then when dishwashers became popular, large farmhouse sinks were no longer necessary and in most houses they were replaced by smaller and lighter standard sinks. But as they stopped to be necessary, people discovered their exceptional decorating values and more and more people started shopping for farmhouse sinks – this time treated as valued and cherished features of kitchen decoration. However, the modern version of the farmhouse sink has been updated to include such spiffy wonders as a copper farmhouse sink! Grandma wouldn’t recognize this beauty! A farmhouse sink isn’t very cheap, especially if it is also an antique. Make up your mind before you buy it – if you find the sink ugly and decide to throw it away, you will waste a lot of money. Always check the shipping cost – a farmhouse sink is usually very heavy and it is possible that there will be some additional fee for heavy items. As sometimes it is about twice as high as the standard shipping cost, it is something worth checking, especially if you’re trying to economize. However, it’s important to note that lots of farmhouse sinks these days offer free shipping, like the one pictured above which included free shipping – no small thing. A farmhouse sink is very heavy so make sure the cabinet you want to put under the sink is durable enough to support it. Unless you really want it, a handmade farmhouse sink is something you should avoid. They are excellent and their quality is usually very high, but they may cause you several problems during their installation. As they’re not machine-made, their sizes can be different up to 2% and this may cause problem during fitting them into their cabinets. But if you’re certain you want a handmade treasure like a unique farmhouse sink, you will be proud and thrilled with your results!